The Kitty Hawk 26 was designed for a client from Wisconsin who, like myself, had also worked for Carver Boat Company at one time. Amazingly, we both worked there at the same time, but didn't know each other. Then again, there were over a thousand employees when I started at Carver! He had worked for Carver at their North Carolina facility for a while and had a desire to build a Carolina-style boat for himself. With a "broken" sheer and lots of flare forward that transitions to tumblehome back aft, the Kitty Hawk 26 is a true Carolina-style sportfisherman. When he is done building her, he may have the only Carolina boat fishing for Salmon on Lake Michigan! The Kitty Hawk 26 features a large cockpit with lots of room aft of the leaning post. This was critical as the boat will be equipped with downriggers for trolling. The 9' beam leaves a nice space on either side of the splash well for an angler to work a fish around the aft corners of the boat. With the engine hung directly on the transom, instead of on a bracket, you should have no trouble fishing from the stern. Up forward there is a small casting platform with lots of storage underneath. The console is large enough to give protection from the weather and has space inside for a portable head. Forward of the console is a 128 qt. cooler with a cushion on top for additional seating. Her hull design is a modified vee. 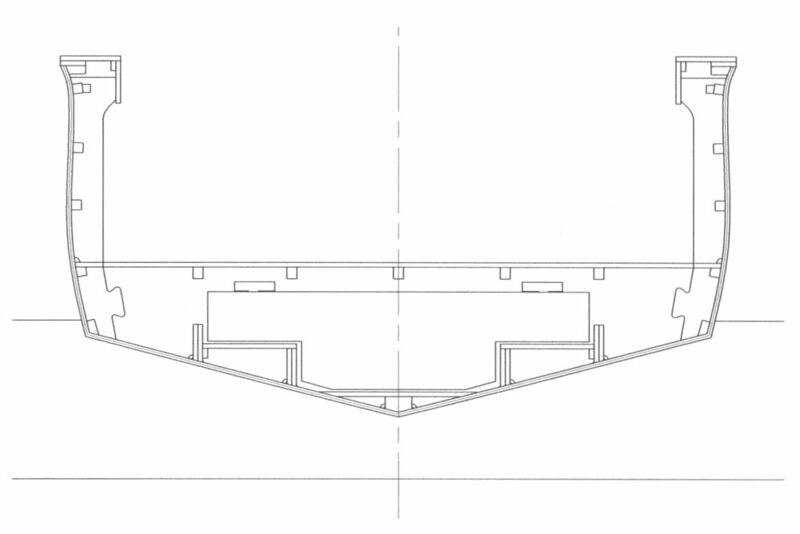 The fine entry is over 48 degrees at station 1 and flattens to 12 degrees at the transom to promote efficient planing. For structural reasons and ease of construction, the chines do not have integral flats, but rely on external spray rails angled to throw the water and spray out and down. Her topsides flare in the traditional Carolina-style and there is quite a bit of tumblehome back aft. A quarter guard is mounted on the hullside aft to help protect the hull from docks and pilings. Her freeboard is a little bit higher than on many Carolina-style boats, especially back aft where the cockpit depth is 28". Her cockpit sole is 6" above the waterline back aft, so should drain well even with a couple of guys working a fish off the stern. The Kitty Hawk 26 features cold-molded construction using 2 layers of 9mm Okoume marine plywood over longitudinal stringers and transverse frames. Her hull is covered with a layer of 1808 knitted biaxial glass set in epoxy. Keel, stem, side stringers, chine logs and clamps are all of laminated fir or mahogany. Her bottom stringers and frames are cut from18mm Okoume marine plywood. The transom is three layers of 18mm Okoume with the stringers let into the inner two layers. She is designed very conservatively and should prove sturdy over the long haul. Originally planned for straight inboard power, we switched mid-stream to outboard power as trying to source the strut was proving to be a real nightmare. Casting one-off parts for a boat this size is somewhat expensive, that is if you can find a manufacturer willing to even do it for you. I sent emails and left phone messages for a couple of months with one foundry and finally gave up on them when they couldn't even be bothered to return my messages. Needless to say, I won't be recommending them as a supplier in the future! So the decision was made to switch to outboard power, which should be simpler to build, faster, quieter and probably more efficient. It also opens up the console space for the aforementioned head and makes for a much simpler fuel tank layout. With her moderate deadrise and relatively light weight, a 225hp outboard should push her 32 knots. A 300hp outboard will give her a top speed above 37 knots. The Kitty Hawk 26 was not designed to be a high-speed kingfish boat, she was designed to be a conservative, seaworthy fishing platform. (11/29/17) After years of requests and constant badgering from clients and potential clients, I have added a twin engine option as well as a single engine, bracket option. These changes are now included in the Plan Set. I still don't see the need for twins, but in business you have to give the people what they want! The Kitty Hawk 26 is available as both a Plan Set with full size frame patterns or as a CNC cut Frame Kit. The Plan Set includes 18 pages of drawings and 6 very large pages of patterns printed on plastic film to insure accuracy. The patterns were created from the CNC cut files and are a bit complex as they include all the cut-outs for the stringers, chines and clamp. Drawings include a strongback and a stem mold drawing for the laminated stem. The plans have also been converted to metric, for those of you outside the U.S. The CNC cut Frame Kit includes both the permanent and temporary frames, longitudinal bottom stringers, the 3 layer transom and a building jig to help in setting the boat up. There is also a pre-cut form for laminating the stem to the correct shape. 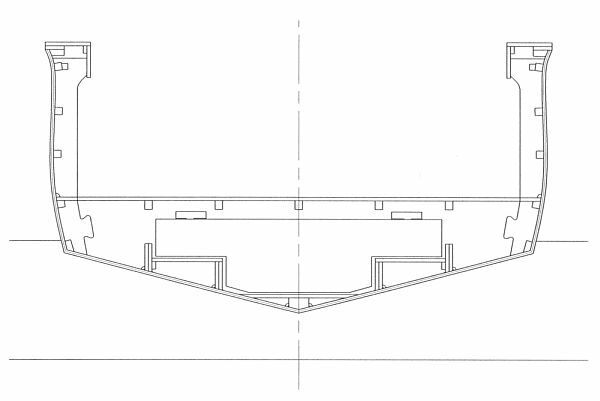 The Frame Kit includes 14 pages of drawings from the Plan Set detailing her construction, including hull and deck details and a machinery arrangement. Whether you choose to build from the Plan Set or the Frame Kit, she will be a challenging project to build, especially in light of her size. If you are up for the challenge, I think she will make for a fine offshore fishing boat. The curvaceous hull of the Kitty Hawk 26 will stand out in nearly any harbor! Click here for answers to some Frequently Asked Questions! To see photos of a Kitty Hawk 26 under construction, please visit the Underway page. Study plans are available below as downloadable PDF files. These can be opened with any PDF reader, most people already have the free Adobe Reader installed. Please remember that these plans are the property of Smith Marine Design and should not be used for any purpose without my written consent. If you are in the Continental U.S. and would like to order the Plan Set, you can use the online ordering system below. The cost is $600.00 plus $30.00 shipping in the continental U.S. If you are in Alaska, Hawaii, outside the U.S. or would like to pay by check or money order, please contact me. As costs for cutting the kits is constantly changing due to material and labor costs, I can not offer the kits at a fixed price. As I write this in 2014, the price for the Frame Kit is about $4,500. If you are interested in the CNC cut Frame Kit, please contact me and I will get you an up to date quote including the shipping charges and any applicable taxes.